So, for the last 2 weeks I've been on annual leave, and have had the fortune to be "on a roll" with my coding. I'm currently concentrating on KDevelop 4. We're privileged to have a new parser framework by Roberto Raggi and Jakob Petsovits. I've been working on extending this good work with a new type system and definition-use chain. On Thursday, I implemented code completion. This is the first real use of the new model-based code completion that I wrote for Kate. By expressing the possible completions in a model, and properties associated with each (eg. public/protected/private, etc), Kate can then perform some advanced functions such as sorting, filtering, and grouping. I'll post a screenshot when I can undo some recent breakage. On Friday I implemented a symbol table, which contains a reference to every definition currently in memory (from all files). I should have done this a week ago - it turned out to be quite simple. Now, hopefully the definition searching will scale up to handle the load when we have all includes parsed in. Some work has also gone into performance of this new system, which has paid handsome dividends thanks to valgrind/callgrind/KCachegrind. Parsing speed was increased by 80%, thanks to the removal of dependance on QTextStream in the preprocessor, an unused symbol table in the parser, and KUrl comparisons in the definition-use chain (which I was surprised about... I thought it would be much quicker given that they should be implicitly shared). More recently, I've optimised the most heavily used paths in the definition searching algorithms, and was pleasantly surprised at the performance increase when switching a critical foreach loop into a const iterator style. 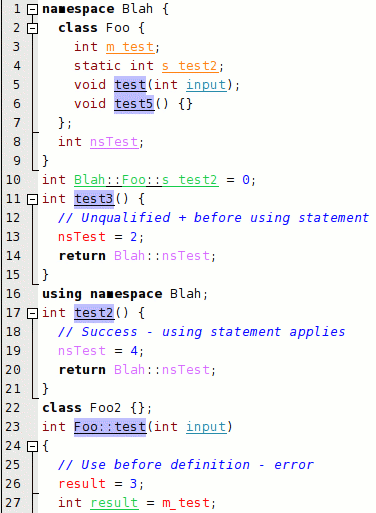 Also, I've discovered QVarLengthArray in optimising our QualifiedIdentifier class; as they are created and destroyed very often, reducing the list overhead was important (note to self: maybe making them implicitly shared would help even more). So, where to from now? We're reaching a fairly stable api, and one which allows for code refactoring, intelligent navigation, improved automatic code generation (eg. I'm looking forward to "create switch statement"), context-sensitive code completion, integration of documentation, debugger integration, a code structure view, call graph, static code analysis etc. If you're interested in helping, we'd love to hear from you :) [as manyoso would say, especially if you have QGraphicsView mad skillz]. Wow, this sounds like great work. I've been dying to find a replacement for slickedit and this might actually do the trick to make kdevelop a viable alternative.